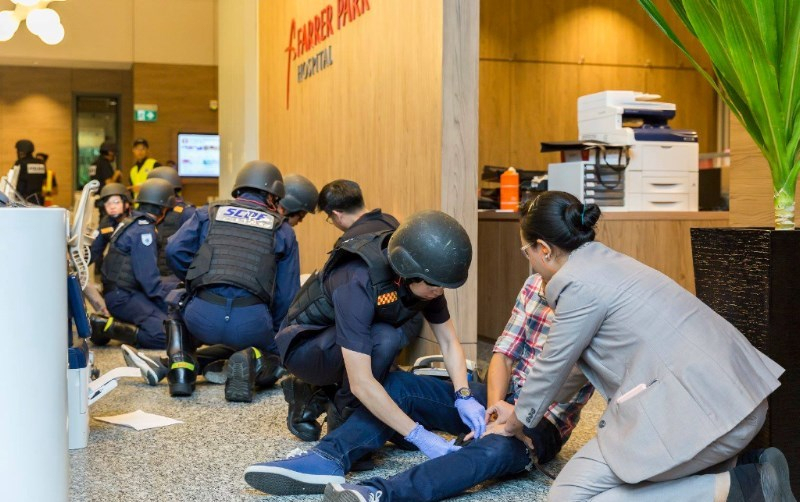 In collaboration with SPF Central Division and Singapore Civil Defence Force (SCDF), Farrer Park Hospital (FPH) conducted a Ground Deployment Exercise (GDX) on 27 October 2018. A security incident where armed attackers wielding knife and gunmen was simulated to test the emergency preparedness of Connexion stakeholders. As the main stakeholder, FPH staff play an integral role in executing the contingency plan. Prior arrangements involving logistics, catering and space management were accounted for to carry out the exercise effectively without disruption to our patients. “It was an enriching experience to witness the SPF in action up close. 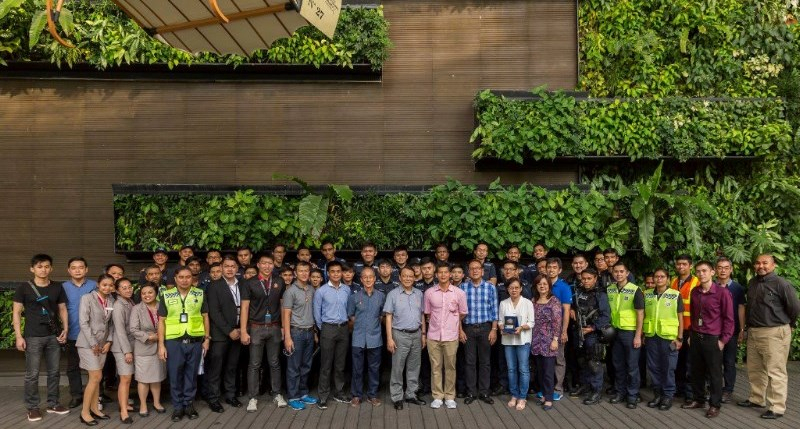 After months of coordinating with both SPF and SCDF planners, seeing the exercise come to fruition evidences all the hard work that FPH and OFH have put in together to make it happen” shared Junaidi, Security Manager of MCST. “The GDX has definitely value-added to our understanding of SGsecure awareness through realistic training” added Yaoquan, Security & Safety Senior Executive of FPH. Enacting a vital role to apply IFAS (Improvised First Aid Skills) and “SMS” the incident to 71999 during the exercise was quite an experience for Siti Nurharah, Assistant Nurse Clinician of FPH. “Beyond what we usually learn theoretically, this hands-on situation has increased my confidence in being prepared to handle such occurrences. It also encourages others to step forward and help as they will not be clueless in handling these emergencies” she said. On top of our efforts to sensitize FPH staff on the SGSecure concept of ‘Run, Hide & Tell’ (RHT) and IFAS, the GDX has also enhanced the coordination between the SPF, SCDF and FPH. This enforces the safety and security of Connexion to facilitate daily operations and to ensure a peaceful environment for our patients and guests. Only one graduate is awarded this honour in any class. For his achievements in clinical cardiology and contributions to education, Dr Lam joins illustrious panel of award winners such as Professor Sir Stephen O’Rahilly of Cambridge, a world authority on metabolism and obesity, Dr Louise Ivers from Harvard who lead the development of post-quake healthcare delivery in Haiti, Professor Conor Ward who pioneered work on cardiac abnormalities and co-described the Ward-Romanov Syndrome. This award comes after his 2014 recognition as Honorary Doctorate of National University of Ireland, Dr Lam is the 6th person to ever receive this award in the university’s 160 years history. Dr Leslie Lam closed a trying chapter in his life in 2017 after being vindicated and cleared of all charges of professional misconduct brought against him in 2011. 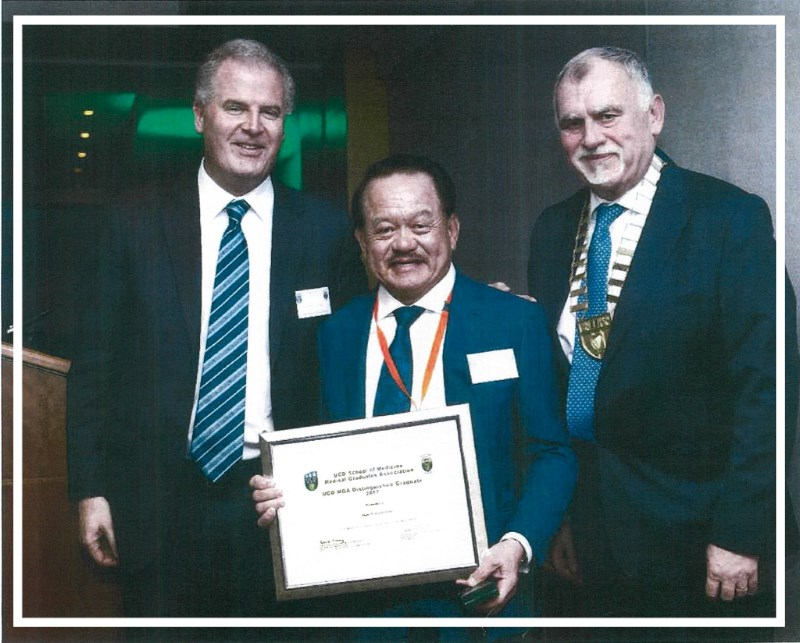 Starting his practice in his new clinic at Farrer Park Hospital, Dr Lam has garnered yet another award from the University College Dublin. Dr Leslie Lam who earned his medical degree in Dublin in 1967, is one of the first doctors to perform balloon angioplasty, a non invasive procedure to open the narrowed blood vessels of the heart in Singapore. For the last 12 years, he has been actively donating equipment and training doctors in this and other life saving cardiovascular procedures in Myanmar. He has currently expanded his educational efforts to Seychelles and has been appointed honorary consultant to Seychelles Health Ministry. Counting royalties as his clientele, Dr Lam still serves patients who followed him after he left Singapore General Hospital in 1988. Almost 300 of them followed him as he went to private practice, and to make access to care affordable, he still charges them $25 for each consult. Dr Lam also manages an extensive wine collection which he sells to raise fund annually. The wines raise about half a million each year of which 80% goes toward Singapore Charities and the rest toward causes in Ireland. Dr Lam is part of Farrer Park Hospitals renown stable of specialists, many of whom have contributed significantly to Singapore’s medical scene. Dr Tan Yew Oo, Singapore’s first Medical Oncologist, Dr Soo Khee Chee, founding director of Singapore’s National Cancer Centre as well as Dr Maurice Choo, founding Chief of National University Hospital’s Cardiac Department. Renowned as the one and only Vocalist Harpist in Indonesia who was also popularly featured on Asia’s Got Talent & X Factor, Angela July requires special care for her vocals as a professional musician and vocalist. 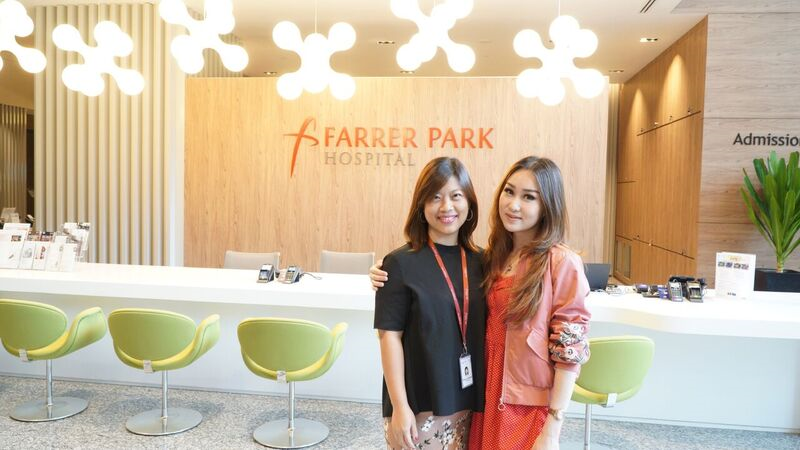 To ensure that her vocal cords are in prime condition, Angela was recommended by Melivon Martheo from the Patient Relations of Farrer Park Hospital (FPH) for an Ear Nose and Throat (ENT) checkup in Farrer Park Medical Centre. What completes the ultimate patient experience for Angela was the exclusivity and neatness of the environment, coupled with impeccable service and care. “Everyone I came across in FPH were very helpful, pleasant and communicative. I am also thankful to the ever helpful and kind-hearted Ms Melivon Martheo, who specially accompanied me during my treatment journey. Exclusive 30% Off All X'mas Goodies for TFPC & FPH staff! Come by Confectionery beside Escape Restaurant to order today!